A couple of years ago Don Cherry released a new book called Hockey Stories And Stuff. English teachers everywhere shuddered, but publishers and bookstores celebrated as it was an incredible seller. Cherry is back with more rollicking stories and controversial thoughts that make for entertaining book. Whether it be tales of Eddie Shore or Montreal Canadiens training camp or of Darryl Sly snoring through a coach's speech, this book is a lot of fun. But what I like best about Part 2 is that the better part of the second half of the book is told by daughter Cindy and son Tim. To have these two tell stories of their dad allows us an intimate look into the man who is really behind the flamboyant suits and big mouth. That alone makes me recommend Don Cherry's Hockey Stories, Part 2. It is a fun, entertaining book that you can read cover to cover or just pick up and read a few passages at a time. The bottom line is this - either you love Don Cherry or you hate him. If you love him, treat yourself to this book. You won't regret it. Also, keep your eyes open for a couple of Cherry DVD releases. Don Cherry's Rock Em Sock Em 22 and the highly acclaimed CBC mini-series Keep Your Head Up, Kid: The Don Cherry Story. P.S. Don wants you to know it's a book the whole family can enjoy. Just finished reading this one and it is an easy read like the first one but i found there to be far less interesting 'stories and stuff' then the first one had. I found the few storys by Don Cherrys son and daughter to overall be uninteresting. 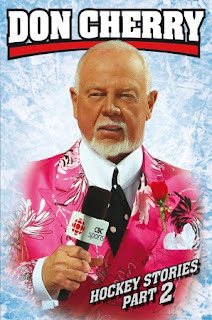 I'd give this a 6 out of 10 and i'm a huge Don Cherry Fan so i'm being generous. As much as i love Don Cherry, if he comes out with another book (i doubt he will) i will have to think twice about buying it.